Children’s Cancer Center is a local non-profit organization serving five counties and over 900 families in the Tampa Bay Area. Their objective is to assist the immediate needs of children and families battling cancer and blood disorders such as Sickle Cell Anemia. “What we do is about now and today,” says Executive Director Patty O’Leary. “It is so important for us to help families with the immediate struggle.” The struggle O’Leary refers to is the whole experience; from diagnosis and treatment to survivorship and, too often, bereavement. Although it is often difficult for such charitable organizations to find financial support, the Children’s Cancer Center has a strong volunteer base. One such person is Diane Wilson, a faux finishing artist. 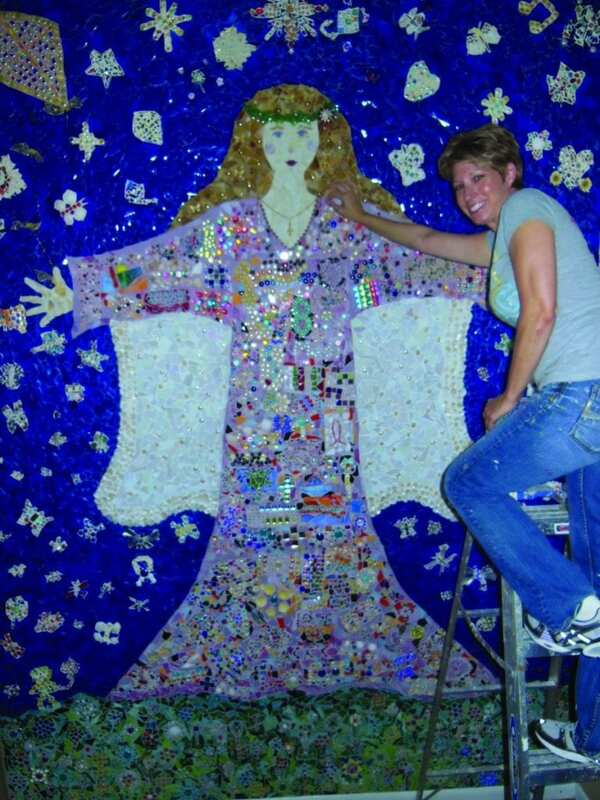 Two years ago, she woke from a dream about creating a guardian angel mosaic and knew she had to pursue it. “I visualized a project where I could interact with children, hospitalized or sick, to create a beautiful piece of art that would be an inspiration to others,” she explains. Wilson holds a special place in her heart for sick children, as she spent years as a child trying to encourage her brother through the course of 25 brain surgeries. “I remember trying to keep his spirits up and to alleviate his boredom and discomfort by singing and joking around,” she says. Now, years later, her brother is fine and she has turned her dream into a source of hope. Once a week for four months, kids gathered with siblings, parents and grandparents. They were given a paper plate and drywall tape, but no specific directions. 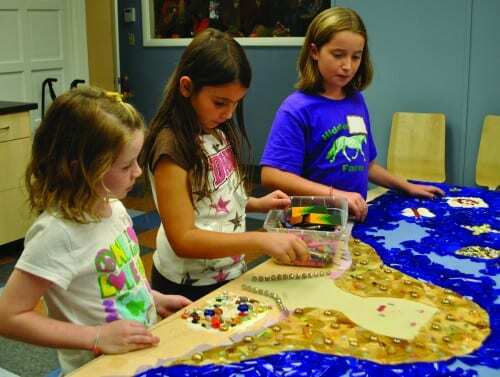 Using shells, beads, glass and other donated items, the kids were encouraged to create from their hearts. Wilson had sketched a picture of what she envisioned, but did not want to interfere with how each child saw his or her individual design. After collecting about 200 finished pieces, Wilson and several volunteers assembled the flowers at the base and glued broken shades of green glass around the petals. They traced the outline of one of the volunteers and the wings were designed by another volunteer who had lost her mother to breast cancer. Now, Wilson’s project of encouragement is on display at Children’s Cancer Center. It’s there for all the kids and families who walk through the doors, and Wilson would like to see it displayed in a children’s hospital, perhaps purchased through an auction to raise money for Children’s Cancer Center. To learn more about Children’s Cancer Center, or to sign up for the Chik-Fil-A ‘Stampede on September 15, visit www.childrenscancercenter.org. September is National Children’s Cancer month. Please consider a charitable contribution to Children’s Cancer Center. For another story of hope check this out.